Director: Beadie Finzi. Documentary about two Brazilian teenagers, Irlan Santos and Isabela Coracy, who hope against strong odds to secure a place in a national ballet company. Twitter Capsule: Dancing teens are draws but also insurance policies; you go along with the doc even though it skimps on key info. It is easy, maybe too easy, to see why documentarian Beadie Finzi and her team settled on Irlan Santos and Isabela Coracy as their focal characters for Only When I Dance, a compressed chronicle of these two teenagers' attempts to win or at least to place at major national and international ballet competitons and thereby secure a berth in an expensive school or a prestigious corps that would otherwise elude them mightily. Irlan is from a notoriously violent favela in Rio, and Isabela from a very poor neighborhood, where her working parents must rely on the pension of her recently widowed grandmother for solvency. If their dancing ambitions fail to materialize, she'll spend the rest of her life in drudgy jobs or at Marianne Jean-Baptiste Lookalike conventions, and he'll be auditioning for background roles as one of Halle Berry's kids. Irlan is that rarest thing, not only an ardent ballet student from the inner-city working class, but a male ballet student at that. The girls who are his classmates at the somewhat desperate-looking Centro de Dança Rio can often be espied crushing on him from backgrounds and group shots, while Finzi's camera sets him rather radiantly apart. The film all but begins with Irlan's father confessing that he was thrown, years ago, at being told by his wife that their son had woken to this particular passion, but he's now such an unconditional supporter that he is prone to tears, and has had Irlan's name tattooed in cursive over half of his forearm. Moving stuff, and Finzi can hardly doubt how ingratiating we will find this utterly un-Billy Elliot dad. So, that's all she's got to say about that. The Isabela storyline, which Finzi picks back up after a solid 20 minutes of tracking Irlan alone, unfortunately proves that she's no more adroit in conveying obstacles than she is in dramatically framing success. 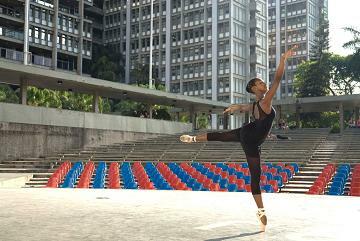 In a country without a single black-skinned dancer in its national ballet, Isabela is chasing a dream that's impossible, or may as well be. Later, for significant reasons, her coach and teacher Mariza Estrella implies that there might be homegrown opportunities for Isabela to keep dancing. We suspect this is doublespeak to soothe a dream deferred, but Finzi doesn't probe. As far as that goes, the film seems permanently uncertain in its approach to Mariza, who speaks so guardedly as her own PR agent that she makes Joan Rivers look like a fountain of uncensored confession. Is she a genuine boon to these kids, or is she a faded dancer who just fancies herself a coach (a vocation at which we never actually see her working), or a moneyed woman who fancies herself a philanthropist (though it's bizarrely unclear what, if anything, Mariza winds up paying for as opportunities open for Irlan and Isabela). She has a bad habit of talking about how hard it is for her to see Isabela's parents pleading to loan officers and handing her their meager life's savings, or to "have to overhear" international judges imprecate the gorgeous, svelte Isabela for being "overweight." But no dramatic bead or added context is forthcoming, much less any tough questions from Finzi, so Mariza remains a weirdly unspecified presence. By my count, the most dramatic thing that happens in the movie is when she, Mariza Estrella, gets unceremoniously pipped in the race for the most fabulous drag-ready name, upon the arrival of Prix de Lausanne administrator Mavis Staines. Mavis indulges the off-screen filmmakers with the mossiest banalities of the art-world bureaucrat. "I will always cherish how Irlan performed here today," she offers in an oddly brisk, Catherine O'Hara-style deadpan. "I was in tears." Even if she's sincere, she's nowhere near affirming enough to click as an interview subject. But we were speaking of Isabela; I, like the movie, keep losing track of her. We imagine Isabela will have trouble because of her complexion and her parents' lack of resources. It's a surprise when she tears up upon relating that "it isn't easy with Mom and Dad monitoring me at every moment," which is how we first learn that Isabela is under pressure to lose weightor else, Mariza has warned the cash-strapped family, their scraping and borrowing will surely be fruitless. It's crushing to hear Isabela deprived of her rightful confidence in her own beauty, and I'd like to have heard her expand more on why "dance means everything to me," to know how or why she withstands a calling that seems miserably out of reach and invites repeated assaults on her self-image. Later, we find out during a doctor's visit that she has re-sprained a foot that we didn't know she had injured in the first place. During this visit, we also discover that she is suffering a stress-related skin disorder, though what Isabela or her family does with this information is never ascertained. When she arrives for her pivotal competition in New York Cityunder financial terms that ought to have been clearer, given the long time the film spends on work plans and borrowing attempts that keep coming up shortOnly When I Dance reveals a patent failure to secure rights to more than a few seconds of footage from her actual performance. The routine, whatever it was, ends in a flash, which has the additional effect of occluding the most churlish skepticism that Only When I Dance raises but seems too cowed to address: from where I was sitting, Isabela simply doesn't look like a strong enough dancer to reasonably expect a major success at the extraordinarily high caliber of competition she has entered. Whether for coerced or elective reasons, the documentary omits even a nanosecond of any other dancer's performance, either at home in the Centro or on these international stages. Consequently, we're powerless to form any comparative sense of these two kids' abilities. Granted, Only When I Dance seems more interested in the social factors and familial dilemmas that not only surround Irlan's and Isabela's aspirations but actually become other people's aspirations; Isabela's grandmother is coolly moving in describing how hard it is to watch her son unable to foster his daughter's keenest desires. Assessing Irland or Isabela on strict merit is probably not the point, but Only When I Dance seems too sensitive to pursue the sharper film it might need to be, one that explores how resourceless families will sacrifice as much for a child whose talent may not be extraordinary as for a child whose talent seems more persuasive, and the "sacrifice" may be an indenture of means the family doesn't even possess, and likely never will. Compounded, though, by the mismanaged intimations that Mariza may or may not be much of a mentor and that Isabela's parents might be much harder on her and more stage-parenty in private than they ever are on cameraand if they are, destitution may be pushing them to stake a lot on their daughter's possibilitiesit becomes impossible to take Only When I Dance seriously as more than the superficial account of a frustratingly tentative bystander. If anything, Finzi seems to know less about what's going on in these households and at these competitions than almost anyone else around. That might be true of a lot of documentarians, even much stronger ones, but whether out of compunction or imprecision, she never suggests that she's even trying to make a film that asks tougher questions about what factors might be structuring Irlan's success and Isabela's disappointment, above and beyond the question of talentwhich, again, seems somewhat off the table. Who is it that tells Isabela that she fell short at the New York competition specifically because of her weight, and is this fully reliable information? When and how does teenaged Irlan negotiate with the American Ballet Theatre, while he's traveling alone in a foreign city? How badly in debt is Isabela's family, and how are they treating her? Is her allergic dermatitis getting better or worse as all of this transpires? Was it as easy as it winds up looking for Irlan's parents to open their own café as self-designed "therapy" for his looming departure, and if so, has his path to success been somewhat more lubricated than we've guessed? Or is this yet another way in which doting parents put themselves in hugely vulnerable positions out of love for their children? The film says "favela" as if we can fill in for ourselves just how imposing an environment this must be for Irlan, but is it really right for Only When I Dance to leave it up to me, who has never been to Brazil, to project exactly how bad his situation is? What is it like for him to get from home to the dance studio? Who does he pass, and what does he encounter? What kind of camaraderie, if any, exists between Irlan and a female dancer, also from Rio, who wins alongside him in Lausanne? What do other kids think of him, or, for that matter, of Isabela? Is racism only a concern at the level of casting the national ballet, or has she got it tough even in the neighborhood haven, among her lighter-skinned peers? Only When I Dance offers a welcome respite from the hyperbolic fire and flash that typify so many favela stories made in or out of Brazil, though it would be nice to praise the documentary for something it does rather than something it gratifyingly avoids. Irlan's uncut Nijinsky number and the modest candor with which Only When I Dance captures the fatigue as well as the heartbreak of poverty, even or especially in moments of pie-in-the-sky optimism, give the film some lingering power. I can imagine it inspiring young dancers or idealistic coaches and philanthropists, who hopefully emit fewer frissons of self-indulgence than Mariza does, at least in the way Only When I Dance has been edited. But in most respects, the movie is disappointingly rudimentary in assembly as well as conception, and feels like a missed opportunity even in the sequences when destiny presents the moviemakers with nearly perfect conditions for celebration, reflection, or more energetic digging.